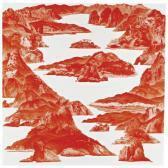 Find artworks, auction results, sale prices and pictures of Sea Hyun Lee at auctions worldwide. Please kindly note that Lot 455 is signed by the artist on the reverse. Nicholas Robinson Gallery, New York, USA, Between Red, April-May 2011. Since his graduation from Chelsea College of Art and Design, London in 2006, Lee Sea-Hyun has been successfully developing his signature scarlet landscapes, gaining a growing recognition in the international art world. Lee's mesmerizing landscapes are a kind of schematic diagrams telling multiple things about Korea and her culture. To most Koreans, especially a generation who received a heavy anti-communist education including the artist himself, 'red' immediately manifests a social taboo. Lee's ongoing Between Red series began with depicting the Demilitarized Zone, known as DMZ that cuts across the Korean Peninsula, acting as a buffer zone between North and South Korea. Then he went on to combine it with Korean traditional scenery disappearing due to rampant development. Between Red-111 (Lot 455), featured here, comments on his reality living in a divided nation and provides the viewer with an opportunity to re-illuminate beautiful mountains overshadowed by high rise buildings. It also gives the viewer a dazzling visual impact close to a hallucination. It is effectively achieved through eye-catching red colour and manipulation of perspective. Lee incorporated the Asian tradition of flat landscape with traditional Western perspective. Mixed together, it brings an uncanny effect with individual patches of perspective landscape set against a larger stretch of flat non-perspective one and evokes within the viewer psychological fear and longing. Since his graduation from The Chelsea College of Art and Design in 2006, Lee Sea-Hyun's works have been pursued by prominent art institutions, including the Uli Sigg Collection and the Burger Collection in Zurich. In his masterpiece Between Red-134 (Lot 2404), Lee revitalizes the cultural traditions with his creativity. He deliberately contrasts the whiteness of negative space solely with vivid redness. The monochromatic colour tone projects of his conception of scenery in face of the political climate and the rapid development of Korea. Lee Sea-Hyun received his second MFA from Chelsea College of Art and Design, London, in 2006. He received his first MFA from the Graduate School of Hongik University, Seoul, in 2001. After uncovering of his notable series of red landscape paintings, it didn't take long for him to receive global attention from many notable institutions and organizations. His paintings are collected by highly reputed collectors and institutions for their quality and can be found in the following collections: the Uli Sigg Collection, Zurich; the Burger Collection, Zurich; the Bank of America, Boston. Lee also has participated in numerous international exhibitions at the crucial institutes such as Minsheng Art Mueum, Shanghai; Seoul Museum of Art, Seoul; Furini Arts Contemporanea, Arezzo, and among many others. 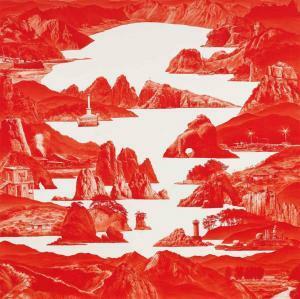 Lee has been successfully developing his unique style of red landscape, carefully devised in choosing color and topics. To Korean, especially a generation who received a heavy anticommunist education including the artist himself, the color red immediately manifests the red complex and social taboo. By using red, the artist unveils his emotional state and perception on utopia dystopia most dramatically, along with the reality of division and the inner side of natural scenery. 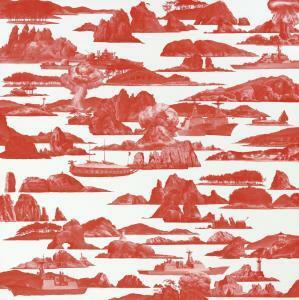 Lee's ongoing Between Red series was begun with depicting the Demilitarized Zone, known as DMZ that cuts across the Korean Peninsula, acting as a buffer zone between North and South Korea. 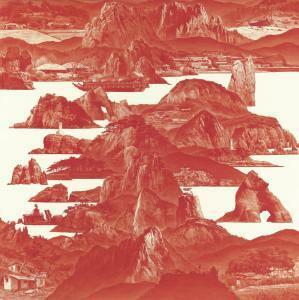 Lee then went on to depict disappearing scenery of Korea due to rampant development. Between Red 139 (Lot 1443) shows his current phase of the series. It is most likely a schematic diagram illustrating numerous things about Korea. It comments on Korean's agony derived from the reality of a divided nation which people lives in, and provides us with an opportunity to reilluminate those beautiful mountains which are overshadowed by enormous urban buildings. The scenery he depicts in this painting shows a disappearing utopia, while revealing a dystopia caused by human's massive destruction. Besides the abundant connotations, his painting is also visually fascinating, which is achieved through the eye catching red color and the manipulation of perspective. 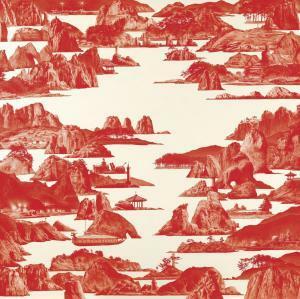 Lee incorporated the Asian tradition of flat landscape with traditional Western perspective, by merging these two elements together; the result is an uncanny effect on the individual patches of perspective landscape. As such these landscapes are set against a larger stretch of flat non-perspective landscape and evokes within the viewer a psychological fear and longing. 200 by 200cm. ; 78 3/4 by 78 3/4 in.